Listen, I'm not sure what to do here, but I maybe have some bad news. Y'see, Grace Wheaton -- that new girl over at Marshfield Manor -- she was supposed to be here, right now, to introduce herself and talk to you all. Me? I'm Ronny Tooney. You can call me Ron even though nobody else does. I wish they would. They all call me.... well, never mind what they call me. Here's the thing. Just because I got my PI license through an online course and I've never actually done any real private investigating doesn't automatically mean I'd be bad at it. I've got to be good at something, right? Grace doesn't trust me. At. All. In fact, she thinks I killed Abe, the head curator. She's pretty darned convinced of it. I swear on my momma's soul, I didn't. If I did would I be here telling you she's missing? Grace, that is, not my momma. No. And don't give me any of those "You're just trying to shift suspicion elsewhere" lines. I'm innocent. Just trying to make a go with this new career. Anyway, it isn't like I stalk Grace or anything, but I make it my business to know her business. Can I help it that she gets creeped out that I'm always hanging around? But if I don't stay on her radar, she'll forget about me. She's got the power to retain my services. But she won't. Too many people warning her against me. Including that gardener fellow, Jack. He's sweet on Grace I think. But he's trouble himself. Never has a kind word for me and I swear if no one was looking, he'd clock me but good. I'm not looking to date her, guy, I'm looking for a job! Anyway, the important thing is that Grace isn't here. She should be. I hacked into her email and saw the reminder she set for herself. Don't know where she could be. She was supposed to go meet a guy. Shoulda been back by now. I'm starting to get worried. Hey, while I'm here...do you need the services of a PI? I hire out cheap. Seriously. I'd love to help. 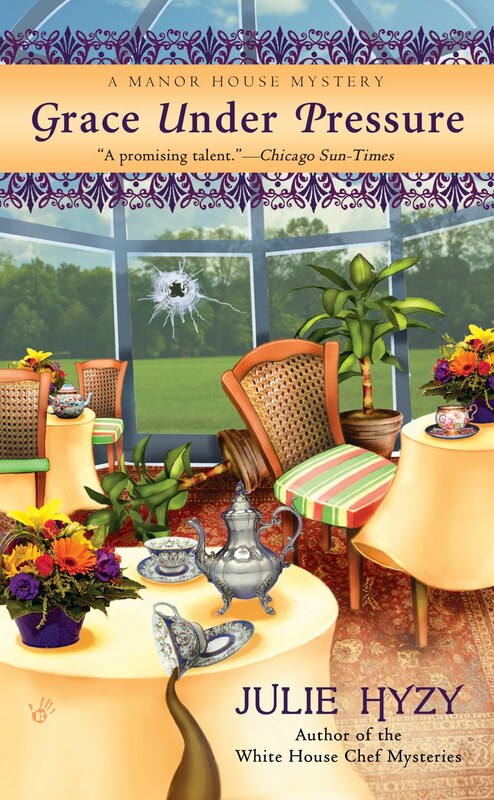 If you need me, you can find me in the the first book of the new Manor House Mystery series, Grace Under Pressure, by Julie Hyzy. I'm in there. I play an important role, but I'm trying to figure out a way to make it bigger. Oh, it's too late? The book was just released June 1st? Dang! Well, if you're ever looking for discreet help. I'm your man. I mean, before I arrived here today, did you even know Grace was missing? I bet you didn't. I figured it out before anybody else. Oh, hey... here come the cops. I'm outta here! Roony, Roony, Roony, how is Grace suppose to trust you if you hacked into Grace's email account. If you're worried, what are you doing here, go out there and find her and prove to her and us that you're worthy of your job as a P.I. oops, spelled your name wrong..sorry about that. But where is Grace? Is she just hiding out from that creepy guy or is it something more sinister? It's not like she doesn't trip over trouble you know. Should we be doing anything? I have a tight schedule today, but could organize a quick search. I bet she's off with Jack having a romantic picnic and she's smart enough to go far, far away so Ronny, you won't find her. You're pretty good at what you do, but she's way smarter! Oh, Grace? If I were you, I wouldn't show up all day. Serve Ronny right for nosing in. Now where's Ronny? Why isn't he responding to everyone's comments? Because he's investigating Grace's disappearance, or...? Ronny, perhaps you should come meet a, sort of, friend of mine. His name is Earl Doozier and he got his ghost buster license online. Oh, wait. That didn't work out too well. In fact, it almost got him shot. Anyway you're welcome to come visit Scumble River. I have a feeling you'd fit right in. I'm so afraid someone has kidnapped Grace! Willow, Ronny is over here at my house, meeting Mars's brother, who is also a PI, with the same sort of background as Ronny. We're having brie burgers and home fries for lunch to fortify ourselves for the trip to search for Grace. Does anyone have any clues? I'll let you know what we find once we get inside. Ronny, why don't you check out that Julie person with the last name no one can pronounce? She's smart and hilarious and I think she might have something for you. A job, I mean. If you guys are going to search that castle -- I mean house -- can I come? I'll bet they have the most fantastic flower garden ever in the back and, well, you know I love flowers as much as I love a mystery. Grace, wherever you are, stay away just a little bit longer. I really want a peek at that garden. Sophie, I'm not sure you should trust that Ronny. Grace is missing. Jack may be, too. And Ronny may know more than he's letting on. Besides, Sophie, you occasionally get in over your head. Search for Grace, yes, but make sure someone else is with you at all times. Is Nina Reid Norwood available? Better yet, can Wolfe take some time off work? I think we should organize, form groups and do a search. I have a list of spots where she might be. Grace is such a lovely (and capable!) person. Something must be wrong if she doesn't turn up! We've arrived! Abby is already out back, checking out the gardens. It's so big it could take her a couple of days! Charlotte, Ronny would like to see the list of places where Grace might be. Should we divide the place by floor or by wing? Willow, Wolf wasn't available, but Nina Reid Norwood, Bernie, my ex-husband Mars, and his brother, Andrew, came along to help. I'm worried that Andrew has a thing for Grace. I hope I can keep him from getting into a tussle with Ronny! Okay, Tooney, I'm wise to you. Return Grace to us, and I mean now! Did you think nobody would pick up on your slip at the end there? Okay, maybe not RIGHT now. It won't hurt her to stay wherever she is long enough for us to get a really good look at the house and grounds, will it? And when there's someone I'd like to have kidnapped, I'll be in touch. And while I'm waiting, I'm gonna watch a little home shopping. That always calms me down. I'm in the attics. I've found several dressmakers' dummies and trunks of fabrics that must have been here since about 1920. Silks! Velvets! Satins! I think I'd better unfold every piece and carry them over to the window in case a clue is hidden in them. Oh! Look what I found! No, not Grace, sorry. Embroidered linens. I'll be downstairs to help the rest of you in a minute... No, make that ten. And don't tell Ronny where I am. I got so excited I forgot to bring anyone with me. And yes, Charlotte Adams, I'll put it all away more neatly than I found it. Is Charlotte Bessette here, too? I'm hungry for quiche. I think Grace went to North Carolina--I mean, someplace LIKE North Carolina. And Charlotte McNally, here, raising her hand--if, besides chesse, you need, um, TV. I just discovered you today, thanks to a comment from Avery Aames, who mentioned it in her bio for a guest blog on my site. Wonderful idea for a blog. I'm following, put it on my blog, and I'll be back. I don't know how I missed you! I love the comments today. This is going to be a fun place to stop. I'm very suspicious of you, Ronny. Hacking emails? Sheesh. I hope Sophie is keeping a close eye on you (watch the silver, Sophie!). Lisa, welcome! You found us in less than 3 weeks, and you're just in time to help us find Grace. Not my day for spelling. First I mangled Wolf's name, now Lesa's. And probably a few others. Sorry, folks. Actually, blame it on Janet Bolin. She's the fumbly-fingered one. If Grace doesn't show up soon, I am going to be SERIOUSLY worried!! A gardener told Abby that he saw Grace last night around 8:30, sitting in an arbor as though she was waiting for someone. An empty wine bottle was found in the kitchen trash. The wine glasses have been counted, and none are missing. The desk calendar in Grace's office confirms Ronny's story that she was supposed to meet some guy. But we don't know what it means. I still think that Tooney guy kidnapped her just so he could take her place in this blog. Now watch - he'll "find" her so he can get the credit. Are we going to let him get away with this? Antique fingertip towels? Do you suppose they have them counted? Mary, it's now been about 24 hours, right? This is terrible! Laineshots, I hope your theory is right, and Grace will return safely. But if that Tooney guy orchestrated all this, we'll need to have a good talk with him. I don't know if they have the antique fingertip towels counted, but don't worry. We can copy the designs with our embroidery software and embroidery machines. Sophie are you sure no wine glasses are missing? Did Natasha tie a ribbon on each one as it was counted or something? Hey, I just bought your book yesterday. I look forward to reading it. That's it. I'm calling the authorities. I know y'all fancy yourselves amateur sleuths. I guess *I* solved a murder or two, too. But I know when I'm outgunned and when to call in the pros. I got Cal McCormack to call a buddy of his up there. Hopefully they'll figure out what's up. Natasha isn't here, Willow. At least not yet. She's probably not happy that her significant other, Mars, who happens to my ex-husband, stayed the night. Okay, so he shared a room with Bernie and Andrew, but you know how suspicious Natasha can be. The staff counted the wine glasses. This is such a fancy place that they inventory everything. I'm sure they've counted those fingertip towels, too. Ronny wasn't allowed on the premises with us, so I have no idea where he has gone! I'm sure Molly Pink would be glad to help look for Grace. She wouldn't mind checking out that fabulous house either. I bet there are some antique crocheted doilies sitting on a table somewhere inside. Though maybe by now Grace has shown up.